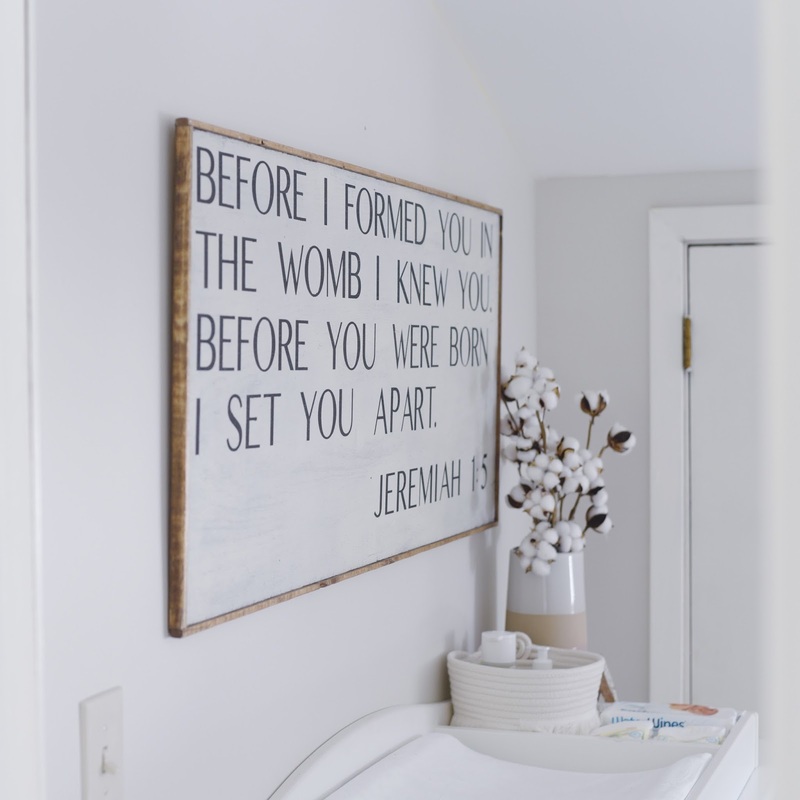 When planning for Emma's nursery, I knew that there would not be a lot of room for decor since the room is so small - so I knew that I would need to be very intentional about selecting wall hangings for the room. 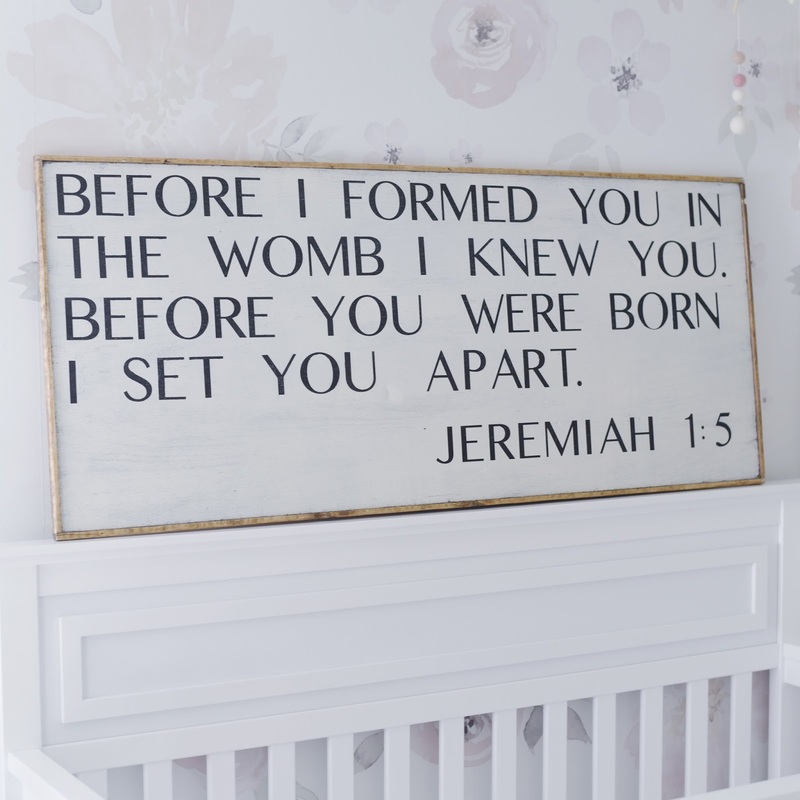 John and I wanted to have a Bible verse and went back and forth on which one we wanted until we finally picked Jeremiah 1:5... such a great truth for our children (and for all of us!). 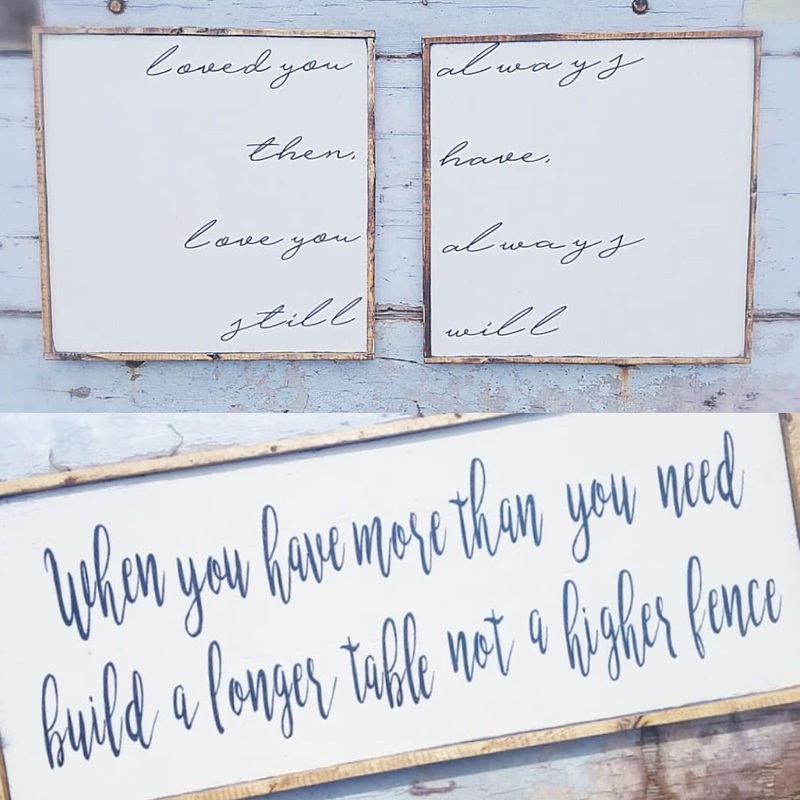 When looking for hand painted signs, I was unable to find any that really fit what I was looking for... I knew I wanted something large (24in x 48in) with a white background and wood frame. Ultimately I decided on a custom made sign from A Beautiful Mess Decor... and I could not love the result any more! Valerie, the owner of A Beautiful Mess Decor, could not be any sweeter or better to work with. She took into account everything that I was looking for and really created something that we will treasure for a long time. It is a clean design (which I love) while still having some vintage and soft characteristics with the exposed wood... and bonus, it was super easy to hang! If someone is interested in ordering a custom sign they can message Valerie on Instagram (@abeautifulmessdecor) or email her at abeautifulmessvintagedecor@gmail.com. ...And make sure to follow A Beautiful Mess Decor on Instagram and Facebook for new product information! One of my favorite pieces in Emma's nursery is unquestionably her Little Bubba Designs felt ball mobile. With Jack we never had a mobile, but I just could not resist the modern, simple look of the wooden half-circles paired with the playfulness of the felt balls! And really, pink, blush and white? It makes my neutral-loving heart so happy! Little Bubba mobiles are completely customized to fit any nursery. Personally, I loved the clean designs and Scandinavian vibe (which is quite timely considering our new home in Minnesota!). And as if it didn't get any cuter than the felt balls, they also hand-make felt animals and characters. Let's be real: does it get any cuter than these woodland creatures or these sheep?! 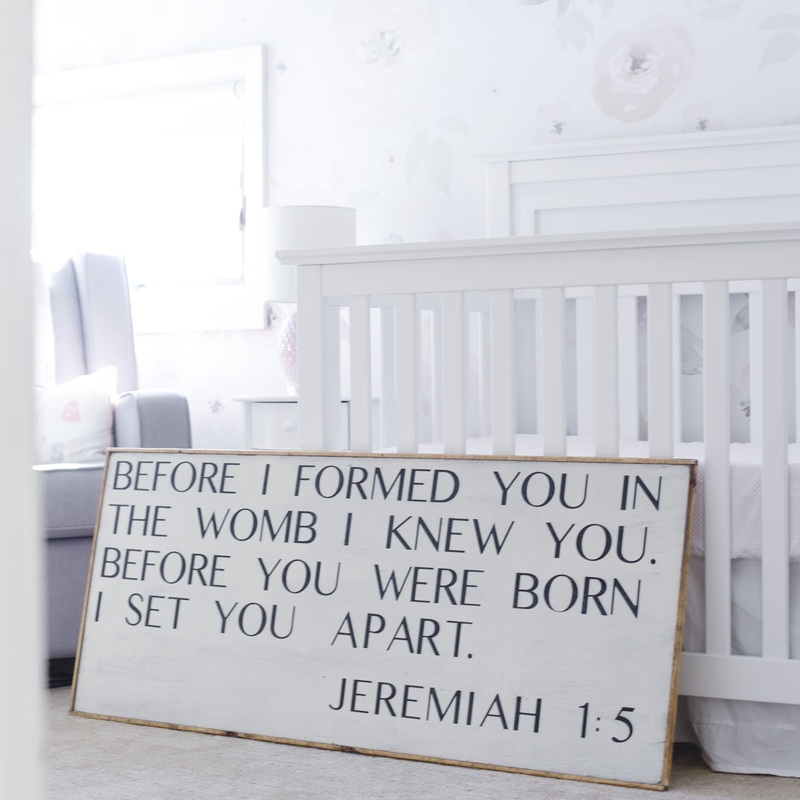 Since everything is custom made you can match any color or design to fit your nursery... and in fact, this customization happens to be the very reason that Little Bubba was started! 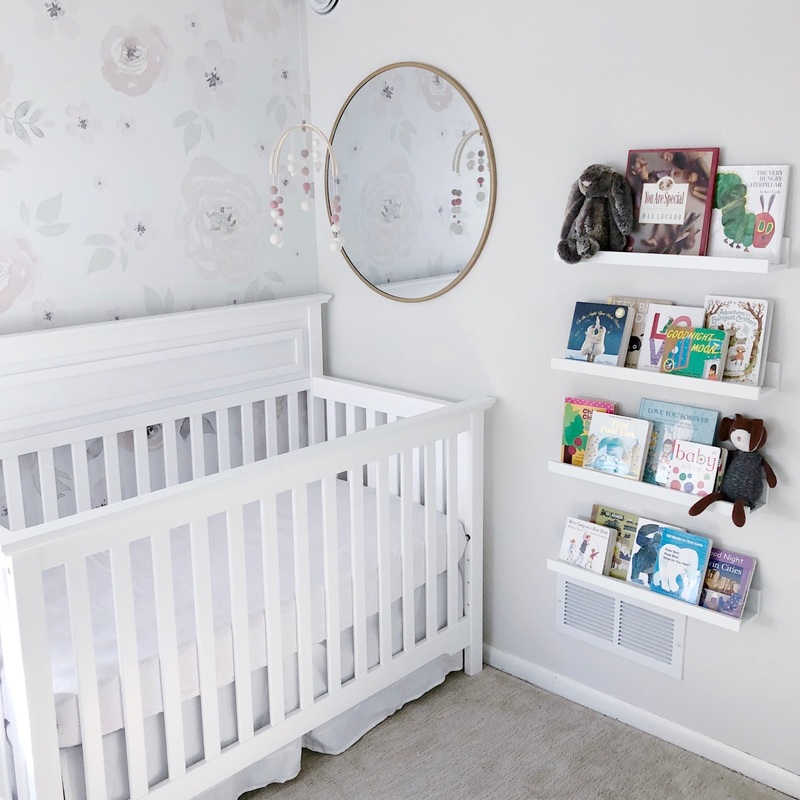 The shop owner, Danielle, has a sweet cutie of her own and when she was designing her son’s nursery she knew she wanted a mobile with particular look and specific colors. She loved the look of the felt ball mobiles but also loved the playful look of the character ones. She wasn’t able to find them merged together, so she decided to make her own! After tons of compliments she decided to start her own shop - how fun is that?! The majority of Emma's room is white or gray and very neutral. The mobile provided the perfect pop of pink and blush without being overwhelming. In addition to the mobile, I really wanted something that matched to hang over a hand-painted wooden sign. And lucky for me, I was able to order a matching felt ball garland to coordinate with the mobile! The garland, which has the cutest tassels at the end, is exactly what I was looking for! If someone is interested in ordering a custom mobile they can message Danielle on Instagram (@littlebubba_yxe) or email her at littlebubbadesign@gmail.com. ...And make sure to follow Little Bubba on Instagram and Facebook for new product information! 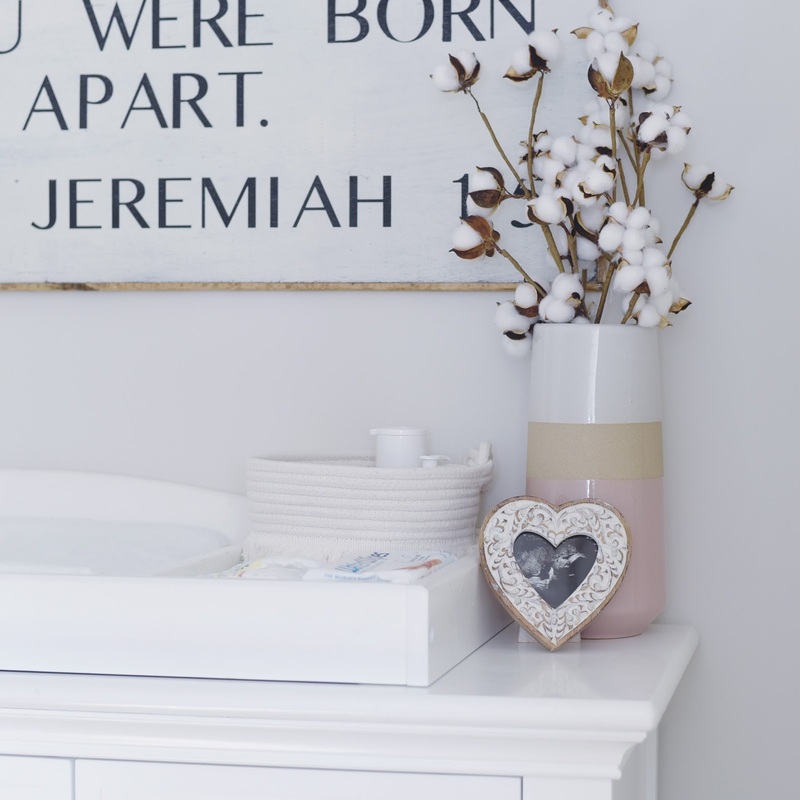 When starting to think about Emma's nursery, I knew that I wanted to keep the overall aesthetic very similar to Jack's room: clean, bright, and neutral... but I also wanted it to have a dainty and girly touch to it with pops of soft pink/blush. Emma's room is quite a bit smaller than Jack's, so I knew I would only have room for the essentials: a glider (with a small table and lamp), crib, and dresser (with a changing topper on it). Other than these essentials we really didn't have room for anything else, which made decorating pretty easy! Since moving from Texas to Minnesota (and purchasing a new home) coincided with being pregnant, my parents kindly offered to paint the bedrooms for John and me before moving in (which was super helpful!). For paint we stuck with my forever favorite: Benjamin Moore classic gray. The color is a very, very light gray and incredibly versatile. Although the walls started off the color that I wanted, I just couldn't get past the idea of having a little bit of wallpaper included! After tons of Pinterest and hashtag searching, I decided on removable wallpaper from Wall Garnish Co.... they have the most amazing watercolor designs (how awesome are these dinosaurs and this cactus print?!). Y'all, this paper is so amazing - the installation was easy (although an extra set of hands is helpful - thanks Dad and Mom!) and it can be peeled off the wall when you want to change things up (but believe me, I won't be changing things up anytime soon). For the crib I stuck with the same one that we got Jack... nothing fancy, but gets the job done! We purchased it using Wikibuy, and if you haven't heard of Wikibuy you need to check it out ASAP! Wikibuy is a "shopping assistant" that compares prices on the same product between different sites (Amazon vs. Target vs. Walmart, etc.) in order to get the best deal. Also, it doesn't just compare the stated price, but also includes the shipping rates (which is important when you're purchasing/shipping large items like furniture!). The best part? It searches the internet for available coupon codes... Lord knows I love a coupon code - so here's to saving money for the win! 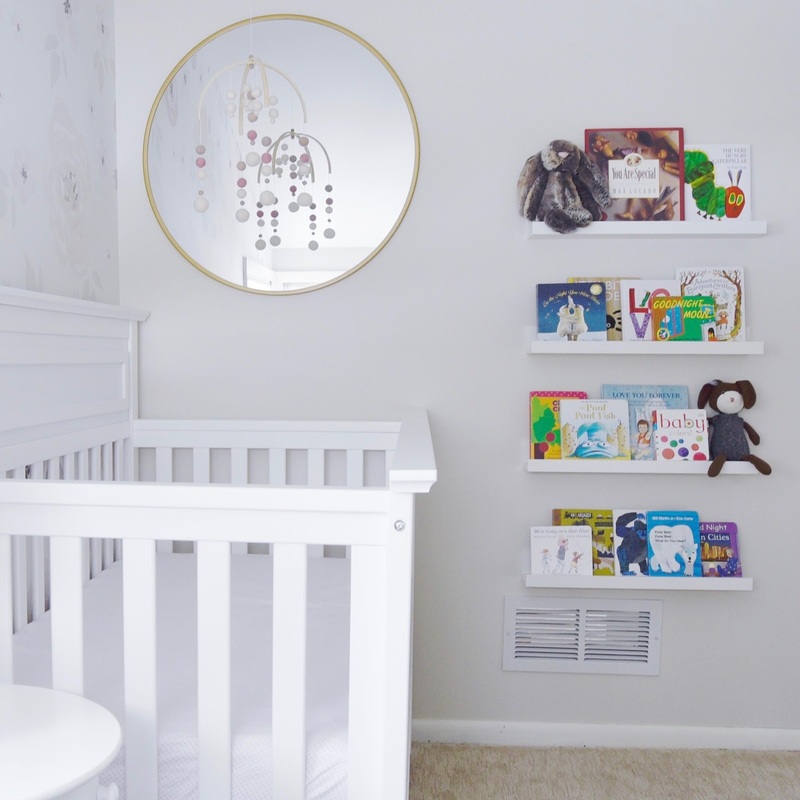 We paired the mobile above the crib with the token Target mirror that absolutely everyone seems to be putting in their nursery... and I know why - it is such an awesome mirror. Easy to hang, a great size and perfect for increasing natural light (especially in a small room) - you can't beat it! We may need to rearrange the placement of the mirror a bit once Emma-girl is older and standing in her crib, but until then, it will stay as-is. Similar to Jack's room, our good family friend, Marsha, sewed some beautiful sheets for Emma's crib. Finding sheets that I like proved to be nearly impossible with Jack, so I'm very thankful for this thoughtful gift! 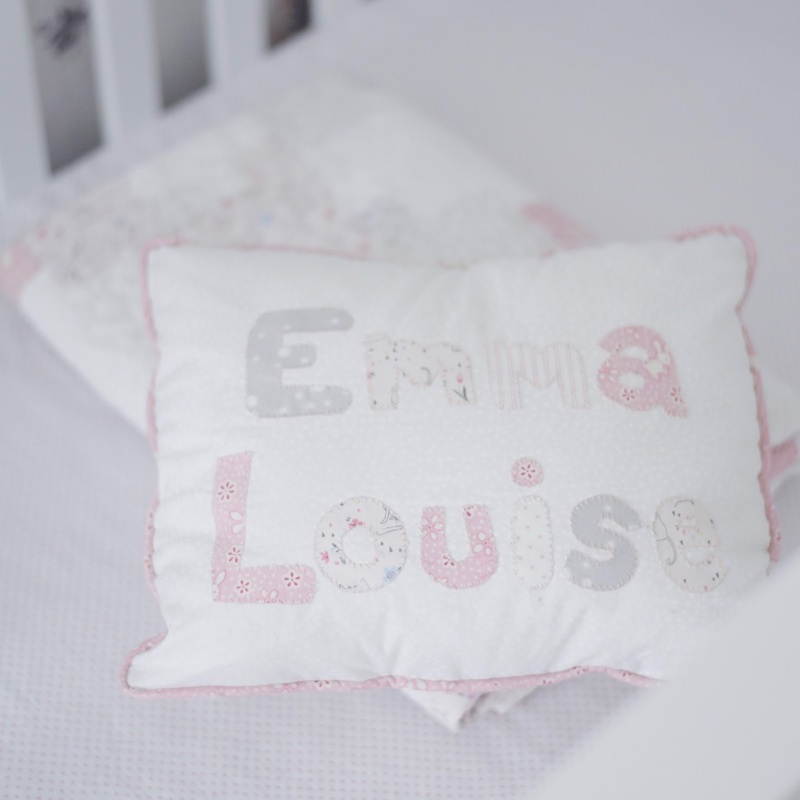 Not only that, but she made the most gorgeous blanket and pillow with sweet Emma's name on it. This makes my neutral-loving and monogramming heart so happy! Speaking of monograms, I pretty much monogrammed everything I could (within reason, of course). I love monogramming for Jack, but there are only so many fonts/designs you can use without things coming off too feminine... so I have certainly had my share of fun embroidering Emma's clothes and blankets! Since Emma's room is so small, there wasn't a ton of space on the walls to hang things, but I knew that I wanted some sort of Bible verse for the room. John and I went back and forth for awhile on which one we wanted, but we finally settled on Jeremiah 1:5. I worked with A Beautiful Mess Decor to design a custom sign, and I could not be more happy with it. They have such beautiful signs - how amazing is this and this?! 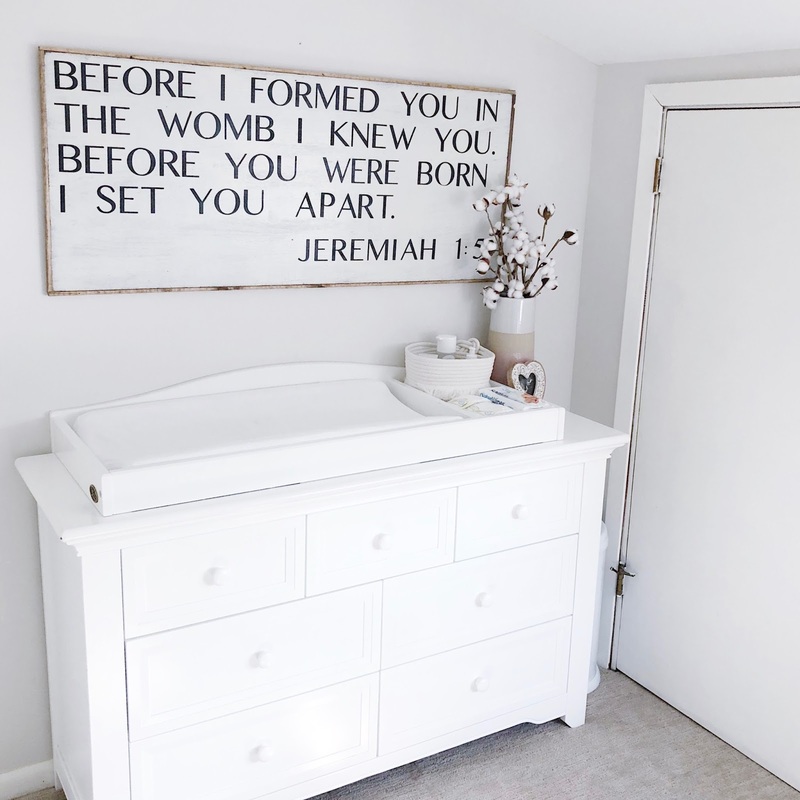 The piece that I chose is an oversized wood sign (48inx24in) that fits perfectly over the dresser and changing table. It is the first thing you see when coming into the nursery and really sets the tone for the whole room. I draped a garland that matches the mobile over the top of it to add a pop of color and love how it all turned out.